A look at how energy storage is expanding across the world. Energy storage has gone global, but in a lumpy and heterogeneous way. That’s the upshot of new report on worldwide storage deployments from GTM Research. The U.S. and Australia led the pack in 2017, thanks to several mega-projects coming online, and market drivers that reward storage investment. Germany and Australia thrive in the residential storage segment, which hasn’t achieved significant scale in the U.S.
China is just getting started, but could surpass almost everyone in deployments over the next five years. Most of these markets have barely emerged from their pilot stages and offer very few use cases for storage that can earn a profit. Expect that to change rapidly in the coming years. 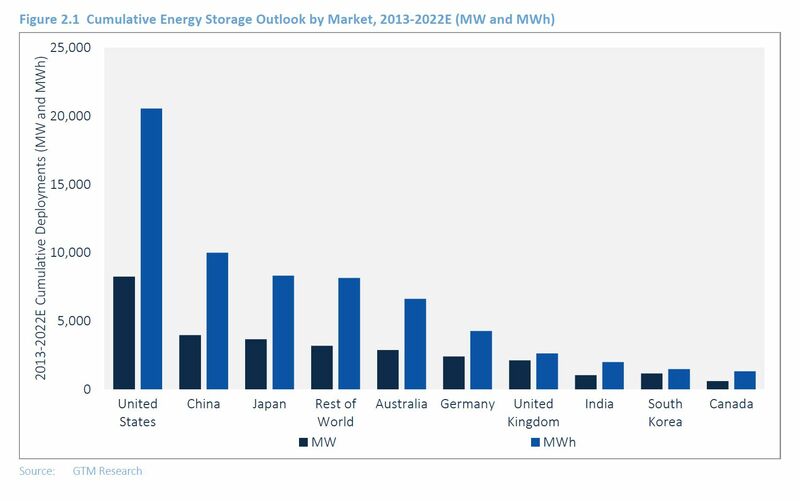 In the meantime, here’s what you need to know about the global energy storage market. It depends on what you’re counting. For power capacity, Australia’s 2017 deployment of 246 megawatts beat out the U.S. and every other nation. Tesla’s record-setting Hornsdale project played a pivotal role, delivering 100 megawatts in one go. Based on energy capacity, though, the U.S. remained top dog with 431 megawatt-hours deployed last year. Australia came in second on that metric, followed by Germany, China and Japan. The U.K., Canada, South Korea and India round out the roster of nations with appreciable storage installations so far. The storage industry has clearly gone international, but remains limited to a few markets, with a negligible presence in most countries on earth. U.S. companies and laboratories have played a pioneering role in developing grid storage, so it makes sense that early deployments there would outpace other places. But the key to achieving large amounts of working batteries is innovative market design, said lead author Ravi Manghani, energy storage director at GTM Research. 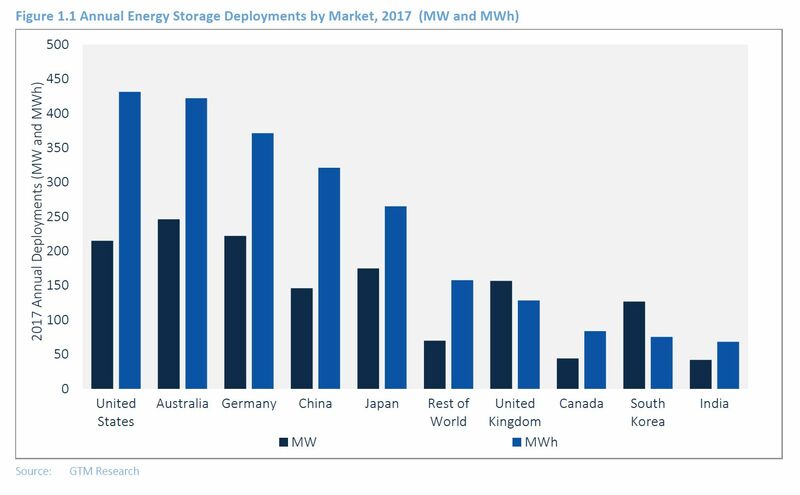 Storage in the U.S. has branched out from the frequency regulation role in PJM territory to serve local capacity, renewables integration, transmission upgrade deferral and other cases, creating a more robust and diversified industry. Fast-forward to 2022, the final year included in the analysis, and a geopolitical shuffle occurs. The U.S. will retain its dominance in battery deployments, according to the report, but China and Japan will bump Australia and Germany out of the silver and bronze positions. “It’s a bit surprising that China hasn’t adopted storage any faster, because it has all the right ingredients to be a major storage market,” Manghani said. China has seized on renewable energy as a national goal, surging to become the largest market in the world. That influx of intermittent wind and solar generation on a grid with transmission and distribution constraints creates an ideal landscape for storage to make itself useful. China has the supply chain to source a massive battery increase. The nation dominates in battery manufacturing, although much of that comes in the form of lead-acid or lithium-ion designed for consumer electronics, which uses a different form factor from grid storage applications. 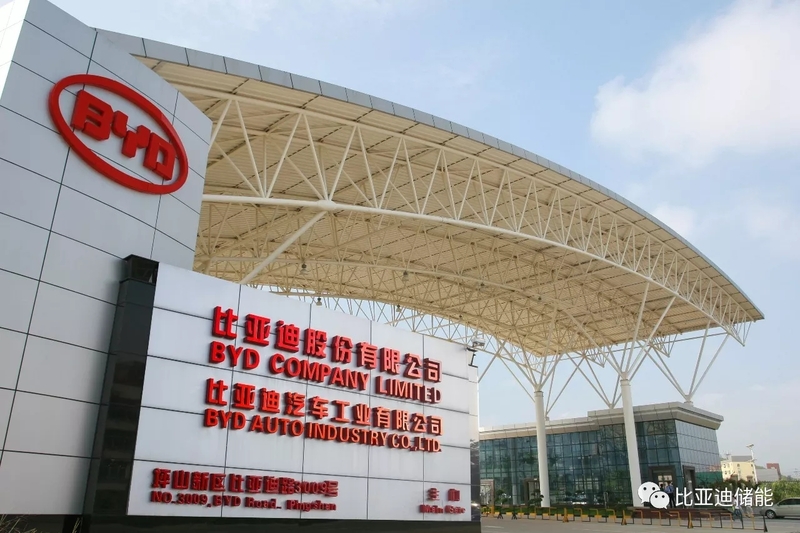 That said, China is building out its manufacturing base for electric cars, buses and bikes, and those form factors can be used for grid-scale applications. The nation’s central planning allows it to move quickly after committing to a goal. So far, the long-range plans have spurred storage demonstration projects, but haven’t called for large-scale deployment. The U.S. will have deployed roughly twice as much cumulative power and energy capacity as China by 2022. Beijing may have won the solar manufacturing race, and the solar installation race, but the battery contest won’t be over any time soon. Australia took top marks for residential storage, after tripling its annual deployments compared to 2016. Storage companies there can tap a perfect storm of market drivers: pricey electricity rates, a massive population of homes that already have solar, and precipitous declines in the feed-in tariffs that compensate those solar customers. Batteries promise to maximize the solar investment through self-consumption. Europe saw increasing residential deployments, led by Germany, which now boasts 80,000 batteries behind the meter (mostly homes, but some businesses, too). Both Germany and Japan used incentives to encourage residential storage adoption as a way to mitigate the grid management challenges that come with large influxes of distributed solar. The U.S. is still learning to crawl by comparison. GTM Research counted fewer than 1,000 grid-connected residential battery deployments in 2016 and 3,049 in 2017. The 80,000 range looks a long way off. South Korea’s transmission and distribution utility Kepco set itself a target in 2014: 500 megawatts in four years. Last year the country installed 112 megawatts across four projects, bringing the cumulative total to 370 megawatts. The primary use case is frequency regulation, in which the batteries defer more expensive payments to conventional generators, freeing them up to focus on energy. “Storage can achieve the same or better level of performance, given their rapid and efficient response, for signals that are rapidly moving up and down,” Manghani said. The downside for the storage industry in Korea is that Kepco identified exactly how much storage it needed for ancillary services, and it’s building exactly that. This isn’t likely to become an ongoing business opportunity; instead, developers will look to longer-duration projects for renewables integration. What’s interesting about Korea’s deployments is that they double as a national economic development program. All the batteries and power conversion equipment came from Korean vendors. That’s not to say Kepco put patriotism before quality: South Korea is home to some of the top battery companies in the world, most notably LG Chem and Samsung SDI. The approach illustrates the possibilities that arise when a country merges grid policy with jobs policy.